In the Monday, April 15, trading in the euro / dollar ended in a slight decline. The euro fell to 1.1298 on Tuesday in Asian trade - up to 1.1293. For me, it was a technical correction. The overall negative sentiment in the US session, the Canadian dollar has created. He fell sharply to all currencies after the publication of the Bank's business survey of Canada for the I quarter of 2019. Based on it, the Bank of Canada will not raise rates at the next meeting. At 11:30 Britain will publish data on the change in the number of applications for unemployment benefits in March, and the unemployment rate and average earnings in February. At 12:00 Germany and the euro zone will release the index of sentiment in the business environment of the ZEW Institute in April. At 15:30 Canada will report on changes in the volume of manufacturing shipments and the volume of transactions with foreign securities in February. In US 16:15 publish data on industrial production for March. At 16:50 with a speech by the representative of the European Central Bank Ewald Nowotny. At 17:00 the US will publish the index of housing market by NAHB April. At 21:00 a speech made by members of FOMC Robert Kaplan. At 23:30 the American Petroleum Institute (API) will publish a weekly report on US oil inventories. 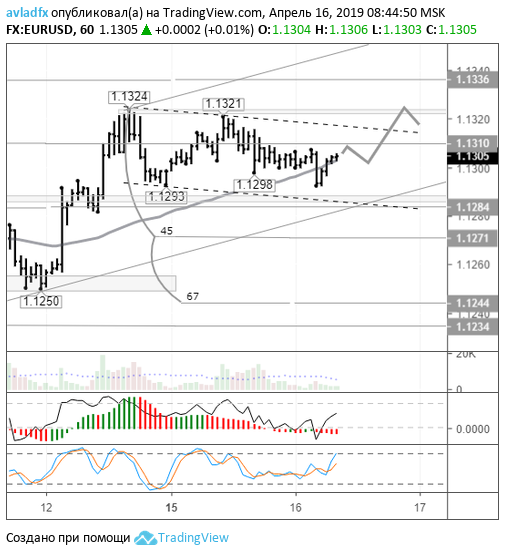 EURUSD pair has corrected, but has not reached the level of 1.1285. For buyers EURUSD is a good sign as well as a new rally may start the balance sheet line. Hourly indicators to unload, so euro buyers are willing to upgrade the maximum 1.1324. EURUSD course revolves around 67 degrees in the local downlink. Built it on three values ​​of 1.1324, 1.1293 and 1.1321. Support shifted to 1.1292. Re-entry at 1.1290 should not be. If EURUSD update Asia at least, you should refrain from buying. Protracted flat at trendline and zones 1.1282 / 90 lead to a subsequent drop in EURUSD rate to 1.1270.